For those interested in horsemanship, this book ranks with Vladimir Littauer’s The Development of Modern Riding. For those interested in military history, this book ranks with the works of John Keegan. The book offers so much about horses and military riding that one cannot capture one tenth of it in a review. Lt. Col. Louis A. DiMarco reveals new insights and debunks old myths as he explains the evolution of military riding. He discusses how cavalry tactics and strategies evolved; the impact of culture, geography and terrain on horsemanship; the cavalry’s tactical and strategic value to skillful generals such as Alexander, Saladin, Subotai, Napoleon, Lee and Allenby; the reasons for the sudden disappearance of large horse cavalry formations in war…and his reasoning may surprise many readers. The author fills the book with fascinating “factoids”. Do you wish to know the weight of a knight’s armor? You will find it here. Do you wish to learn about how the Appaloosa horse developed? You will find it here. Interested in the impact of the American War Between the States on cavalry formations and fighting tactics that Europe ’s generals missed? You will find it here. Over the years, I have read a great deal of military history: much of it written by historians, journalists as well as by field commanders. This book combines the knowledge of a soldier, the insights of a horseman and the research of the historian. Well written, the book will interest anyone seriously interested in horses, military history or both. Lou DiMarco has written an excellent book on this topic, bringing together both his obvious knowledge of the horse and the knowledge gained through his military career. While I've read many other books on horses, this book is the first one I've read which so completely, and entertainingly, synthesizes equestrian history, material culture, and military history. Simply excellent. War Horse is a complete history on the topic, going back into vast antiquity right up to the closing days of the cavalry, and even on to the present day. The book is complete in every sense, going into the horses themselves, the nature of and what this all means in context. All of this is placed in context with examples from representative battles from various periods. No significant historical period is omitted. Battles and periods as far reaching as ancient Egypt up to the Boer War, and beyond that to the current era are all discussed. It's fascinating to be able to read about the Battle of Kadesh, 1275 BC, and the cavalry of World War Two in the same book. Needless to say, writing a book of like this would be a daunting task. A book could well be written on any one era, and on any one topic. Approaching a complete synthesis would be difficult in the extreme. And yet, in spite of that, Ltc DiMarco has managed to do this, and has also managed to keep the entire text engaging and entertaining. This book will be very much enjoyed by those whose interest have brought them here to this site. But beyond that, as the horse in war is so much a part of the history of the horse, it should be enjoyed by anyone with a serious interest in the history of man's interaction with the horse. A wonderful detailing of the specifics and generics of 3000 to 4000 years of horse and rider cooperative development. Easy reading. Except the type face is too small and it lacks enough illustrations. I realize that getting proper quality illustrations is a true burden and getting releases equally so. But this book could have been a six for me with more photos or line drawings. Want to read another great horse book? Try: The Horse in the City: Living Machines in the Nineteenth Century by Clay McShane & Joel Turr. A very well researched book that covers all nations and covers the development of the horse, the equipment, and the skills involved. It is intriguing reading for those with a love of horses and those who wouldn't know one end of a horse with the other! It filled many a gap in my knowledge, and helped to put alot of myths to rest. highly recommended, unbiased, (especially those who have suspicion of USA military history). Un-paralleled in it's content. a must for you Cav types. "With sections on dressage's military traditions and origins as well as discussions of the classic equestrian texts, War Horse is enlightening reading for the history buff. Dressage isn't the sole focus of DiMarco's book --there's plenty of other cavalry-related subjects --but if you're the kind who keeps Civil War or other such books by your bed and tunes in to History Detectives on TV, you'll love War Horse." "DiMarco is to be applauded for his first-rate, detailed study of the history of the military horse. The book is sure to become an essential reference for all things cavalry. War Horse is highly recommended!" "War Horse is an excellent book. In addition to its coverage of military topics, it explores the physical characteristics of horse breeds, the training of horses and riders, and the evolution of horsemanship. Historians of both ancient and modern warfare will find this text of interest, as it attests to the complexity of cavalry actions and considers current trends in military history. Those who love horses will, like this reviewer, be heartened by the book’s focus on the horse and the author’s steadfast assertion of the horse’s selfless service in war." WAR HORSE: A History of the Military Horse and Rider, Louis DiMarco, Westholme Publishing, Yardley, PA, 432 pages, $29.95. 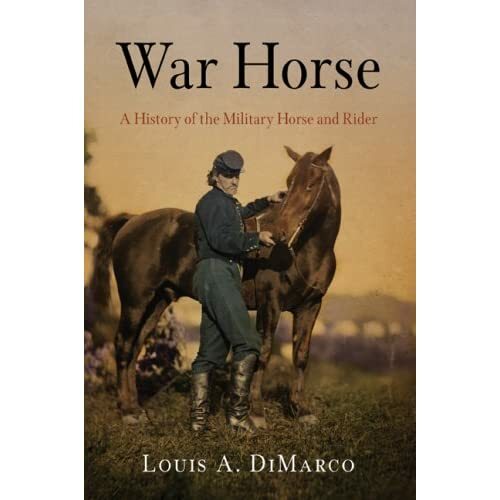 Louis DiMarco’s War Horse: A History of the Military Horse and Rider is a fascinating one-of-a-kind book that looks at military history through the evolving science of horse riding, training, and breeding. Its unique approach offers a fresh interpretation of classic military history from the ancients through operations in World War II. War Horse is a remarkable book on many levels, beginning with the ancient Egyptians’ use of the chariot. DiMarco describes how the desire for increased mobility and economy drove the creation of the warrior on horseback and traces the evolution of horse breeds, horsemanship, tack, the evolution of cavalry warfare, and the contributions of cavalry to warfare: its tactics, operational art, and even grand strategies through the centuries. These developments produced operational and tactical mobility, shock, and firepower. DiMarco illustrates through battle and campaign narratives how the great captains skillfully translated an understanding of mounted forces into battlefield success. He also describes how a lack of appreciation for horses and mounted forces could lead to failure. The book’s ability to penetrate to a level of significant detail, overturn repeated myths, summarize suc­cinctly, and back up its judgments and conclusions is significant. When I began teaching at SAMS I wanted a book like War Horse to educate the officer corps on the constant and turbulent evolution of opera­tional art. The book demonstrates how ideas about doctrine, weapons, branches of service, and organiza­tional designs evolve in a messy but inexorable way. DiMarco is uniquely qualified to write about horse cavalry. He is a retired Army officer and has served in positions from cavalry troop through joint staff. He served as a doctrine writer at the Armor School, specialized in reconnaissance doc­trine and urban and counterinsur­gency warfare at the Combined Arms Command, and is currently teaching military history at the Command and General Staff College at Fort Leav­enworth. Most importantly, DiMarco is an accomplished horseman who has actively owned and trained horses for more than 20 years. As a horse book and horse cav­alry book War Horse is in a class of its own. The natural sentiment toward the horse and horse cavalry doesn’t get in the way of solid and deeply researched history. The book provides many detailed facts about horse types and breeds not often found in books on horse cavalry and delves deeply into the details of riding “tack” and cavalry weapons. I find the battle reconstructions more credible due to DiMarco’s research and knowledge of horsemanship, tack, and weapons. This is my kind of history reading: interesting and intellectually stimulat­ing. It’s the kind of book I like to move through slowly, mulling over the con­tent, fitting the pieces into the messy filing system of my mind. In short, the book is a fascinating and detailed account of an important contributor to human history—the war horse.